Experience natural looking hair color that gently adds shine and luster to your hair with EcoColors home hair color kits! Apply EcoColors Hair Color to cover gray, add highlights or simply enhance your natural hair color with shine, luster and extra body. It is easy to color your hair from the comfort of your home with salon quality hair color with EcoColors Home Haircolor Kits. 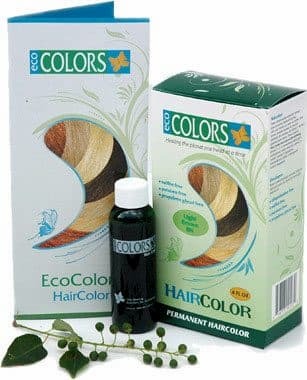 EcoColors is a non toxic super-conditioning permanent hair color with Flax Oil, Castor Oil, 100% Organic Flower Essences, Silk, Vitamin E / C and Natural Preservatives! EcoColors haircolor was created with "non toxic" as a first priority by a concerned Master Hair Colorist and all kits are free of gluten, ppd, sulfites, paraben, and more! We only use the finest ingredients in the composition of our unique hair color. To this day, EcoColors Permanent Haircolor consistently surpasses it's competitors in performance and quality with super conditioning gray coverage that is natural looking and shiny. EcoColors Hair Color is for men and women with all types of hair. After coloring, apply EcoColors Organics Lavender Shampoo & Conditioner for amazing results.